16th-century Ireland experienced revolutionary change, as the Tudor monarchy undertook comprehensive efforts at extending English political control throughout the island. These efforts, together with religious and legal reforms, met with a variety of responses from the native English and Gaelic communities, ranging from eager collaboration to stubborn resistance. 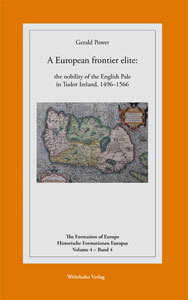 This book offers a fresh perspective on Tudor state formation in Ireland by exploring the interplay between the royal government and the lesser nobility of the English Pale during a formative period, from the ascendancy of local magnate the earl of Kildare in the later 15th century to the beginnings of an intensified extension of English authority under Sir Henry Sidney in Queen Elizabeth's reign. It argues that the default position of this regional frontier elite was loyalty and service to the monarch and to the monarch's representative in Ireland – an attitude based on the peers' traditions and identity, their locations close to the royal capital Dublin, and their relative economic and military frailties. None the less, the nobility of the English Pale did not evolve into a kind of 'service nobility' observable in parts of Britain and continental Europe, whereby aristocrats were co-opted by a combination of inducements and threats into the increasingly centralised and powerful Renaissance state. Rather, relations between Tudor government in Ireland and the Pale nobility were fragile and liable to acrimonious break-down; by the later 1560s the relationship between both groups was one of profound mutual distrust. This development, it is argued, was not caused by conflicting ideological dispositions, but instead was a function of the nobles' comparative weakness and the dictatorial tendencies of Tudor government in Ireland, and forms part of a wider failure of Tudor policy towards Ireland. The fortunes of the nobility of the English Pale therefore demonstrate the complex and unpredictable nature of Tudor interventions in Ireland, and, more broadly, the variety of noble responses to state formation in early modern Europe. Gerald Power lectures in history at Metropolitan University Prague.